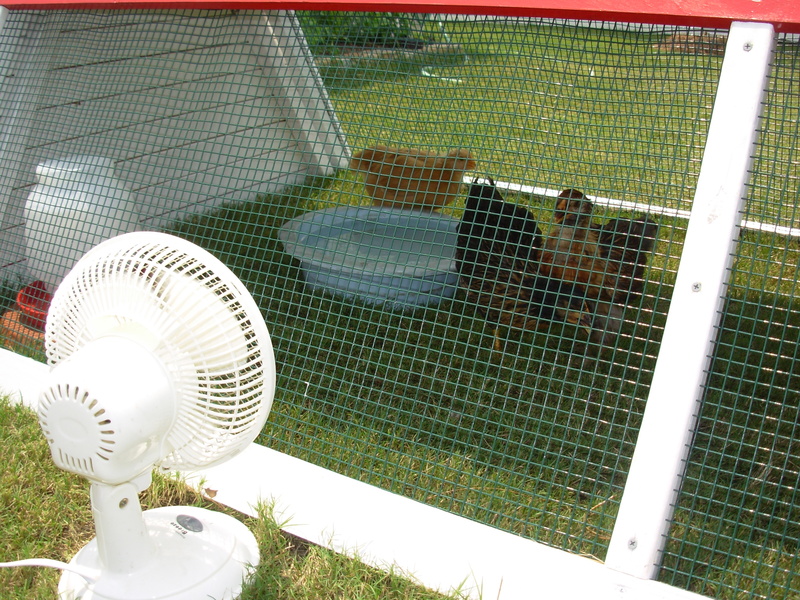 Many of you have been concerned about my chickens during this horrible heat. I’ll tell you some things I do to make their days tolerable. First, at least half of their coop area is shaded all day. As the sun moves around the girls find the shady spot and sit there. I put an oscillating fan next to the wire. 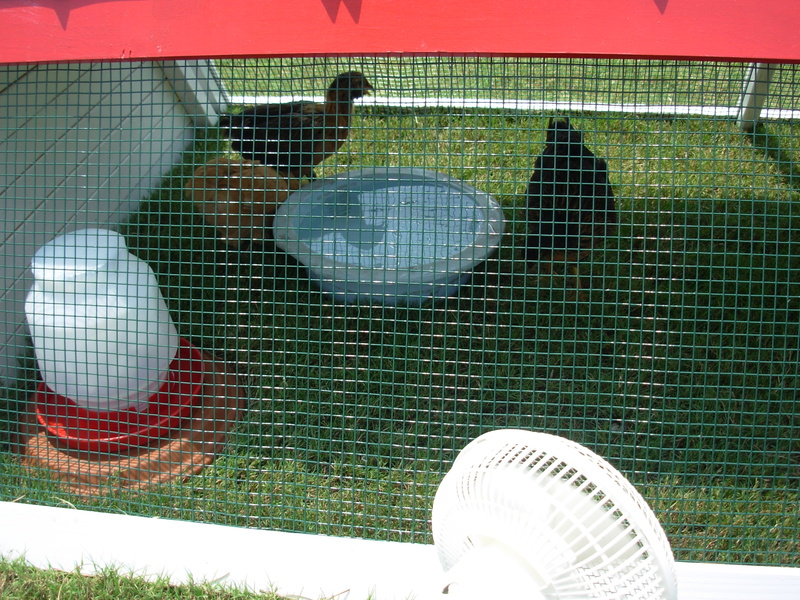 I fill their waterer twice a day with ice water, and I made a kiddie pool for them out of one of Jim’s old oil pans. During the hottest part of the day I bring them a little bowl of frozen fruit. I chop up whatever I have on hand and leave it in the freezer for an hour. 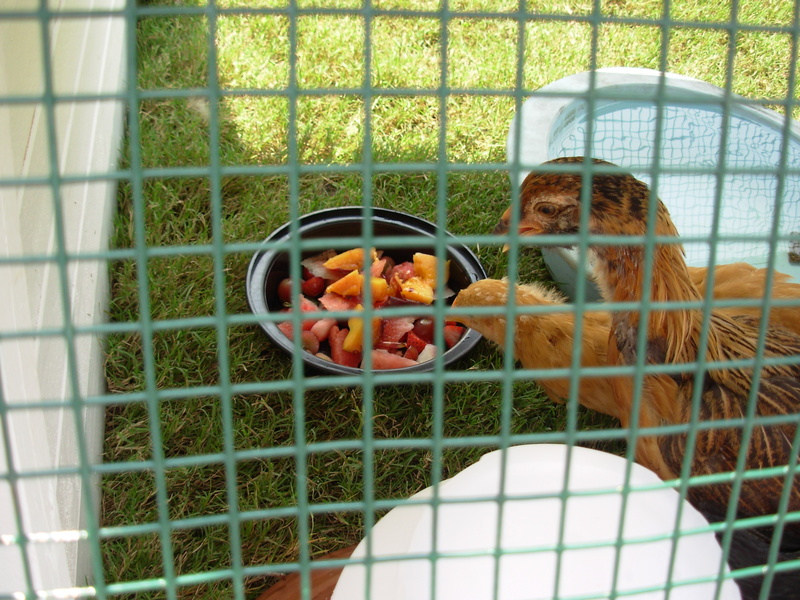 Today’s menu is grapes, strawberries, watermelon and peaches. They stand on the side of the little pool and dip their hot feet in it. Have you ever felt a chicken foot? Well it’s hot!—and pointy! They also dip their beaks in the water and “splash” some under their wings and over their feathers. I keep waiting for one to pretend she’s a duck and just jump in. I would! Are they perfectly cool and comfortable all day? Probably not. Short of bringing them in my air-conditioned house, I’m sure they will be pretty hot during the middle of the day. I went online and read a few posts by some chicken experts who were answering the questions I had about the heat. I’m doing everything they advise and I hope they aren’t too unhappy. We can’t have heat like this all summer (or can we?) I’m not sure this chick will make it until autumn if we do. Keep cool. Your strategies sound great to me. My grandmother had gennys (not sure how to spell that) in rural Alabama in the early 1900’s. No one had air conditioning in those days, and both she & her little chickens thrived. And, I don’t think these chickens had the tender, loving care of your little girls. I think you are being fantastic in improvising with their minute-by-minute care. Good job! It’s a labor of luv and so much fun. Wish they could meet my pal Marcia. Susan you are my BEST CHICK!! !